* 50/50, as unserious as cancer. Or as serious as cancer. Kind of both. Great work from Joseph Gordon-Levitt, Seth Rogen, and an all-around solid cast. * Contagion, in which Steven Soderbergh makes sure you'll never touch yourself again. On the face. ON THE FACE!!! But seriously, this movie is awesome. * Drive, the best movie Paul Schrader never made. Ryan Gosling stars, all Alain Delon-like, in this violent tour-de-force by Nicolas Winding Refn. 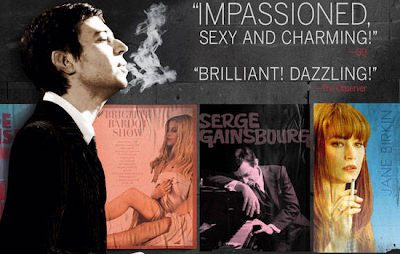 * Gainsbourg: A Heroic Life, a biopic of Serge Gainsbourg from French cartoonist Joan Sfarr. It can't quite sustain its inventiveness, but I liked it all the same. * Higher Ground, actress Vera Farmiga tackles feminism and faith in her directorial debut. * The Lion King 3D, an old favorite shown in a bad new light. * Shut Up Little Man! An Audio Misadventure, a fascinating, thought-provoking look at one of the most infamous pre-internet viral sensations. Portland was lucky enough to have Cinema 21 showing the original 3D version of Alfred Hitchcock's Dial M for Murder for a limited engagement. To go along with it, the Portland Mercury asked me to pick some other Hitch films for home viewing, and I did so by taking a tour of his trailers. Read the column online here. * Boccaccio '70, four Italian film directors team for a 1962 anthology film telling individual stories of modern romance. * Breakfast at Tiffany's, the quintessential Audrey Hepburn film is now on Blu-Ray. * Hung: The Complete Second Season, Thomas Jane returns as everyone's favorite lovelorn hustler. * If a Tree Falls: A Story of the Earth Liberation Front, a thought-provoking documentary about controversial radicalism. * The Inspector General, this whitebread Danny Kaye musical is only offensive in how unfunny it is. * One Minute to Zero, Robert Mitchum makes love to Ann Blyth and hits the snooze button in this Korean War drama. * Road to Nowhere, Monte Hellman returns to the director's chair for a disjointed potboiler.